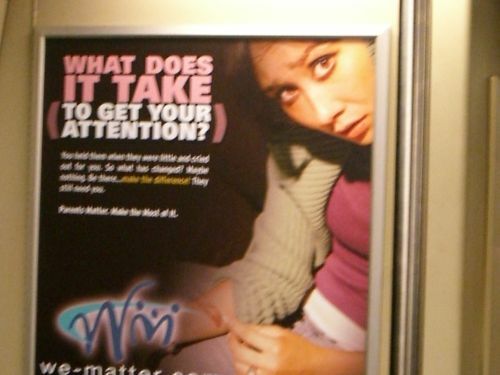 We Matter decided to start the year off right with a series of print ads on BART featuring a girl cutting for want of some nurturing. "How the hell can they wish us happy 2007 with images like that?" snarled the inebriated (but well-meaning) teenage BART passenger who because of his seating in the crowded train was forced to stare at it most of the trip. Hey, at least we know people look at ads and even take them a little personally. Maybe next year We Matter will glam up the campaign by putting one of those HAPPY 2007 party hats on their otherwise not-so-optimistic new years poster children. Read the copy here. We dig wake-up call ads, especially since cutting is a topic in suburbia that's not much addressed (and should be). That starry-eyed revelers had to come across the campaign over the threshold of new years was just awkward timing.